As reported here a number of times, Japan’s Ministry of the Environment under Goshi Hosono (who is also in charge of the Fuku I nuclear accident) is more than ever eager to spread radiation throughout Japan by forcing the municipalities (except one – Tokyo – who will be happily burning the debris from Iwate after a bogus test of mixing radioactive debris with regular garbage to reduce the density of radioactive materials in the ashes) to accept disaster debris from Tohoku. The notice is not what the Ministry would put up on their website as “press release” because it is not a press release. 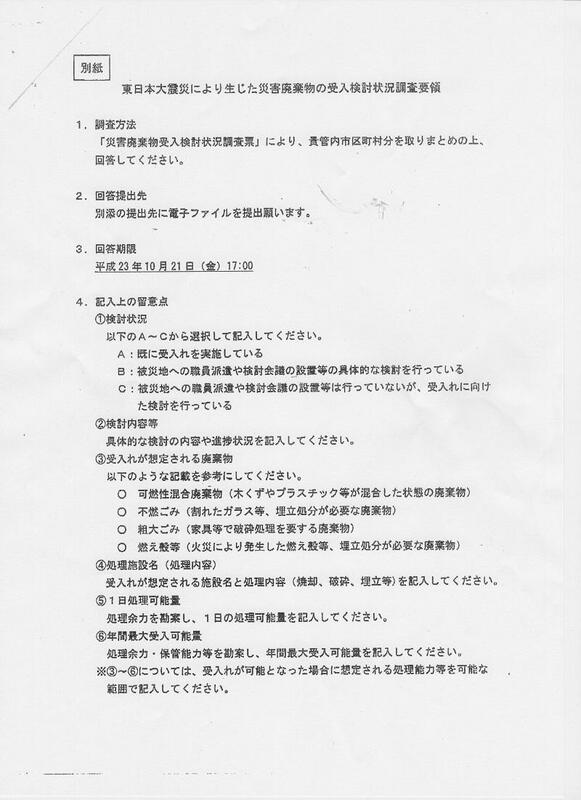 Rather, it is a document only seen by local officials. Unlike the earlier survey where all the names of the municipalities were disclosed and which led to the citizens’ oppositions in those municipalities, the Ministry is assuring them their names won’t be disclosed this time. Some on the net call the Ministry as “The Ministry of the Environmental Destruction”. That’s about right.